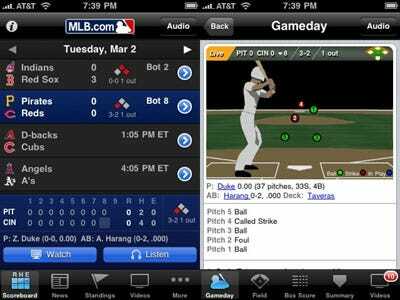 While the general trend for iPhone app pricing has been to lower prices — with the hopes of multiplying unit sales volume, and therefore increase total revenue — Major League Baseball’s new At Bat 2010 iPhone app is proving that an expensive app can still sell well on the iPhone App Store. We’ve asked MLB for early sales data, and we’ll update if we hear back, but we’re guessing that it’s currently selling 10,000 to 25,000 copies of the app per day, which could mean upwards of $200,000 to $500,000 in net revenue so far. (After Apple’s 30% cut.) That’s pretty good. Most iPhone app developers obviously don’t have these built in advantages. (And certainly don’t have the “season” aspect that has allowed MLB to now sell a $5-or-higher-priced iPhone app for 3 years in a row.) So most developers will continue to have a tougher time selling apps for $15, or even for $10, even if they’re super-high quality. Now the question is: How much will MLB.com charge for its iPad app, which the company showed off at Apple’s iPad unveiling next month? The $10 price point that Apple set with its iWork apps? The same $15 as the At Bat iPhone app? Maybe $20 because it’s going to include higher-quality video? We’ll find out later this month when the iPad ships.